These Roasted Chicken Thighs are juicy, tender and perfectly crispy on the outside. 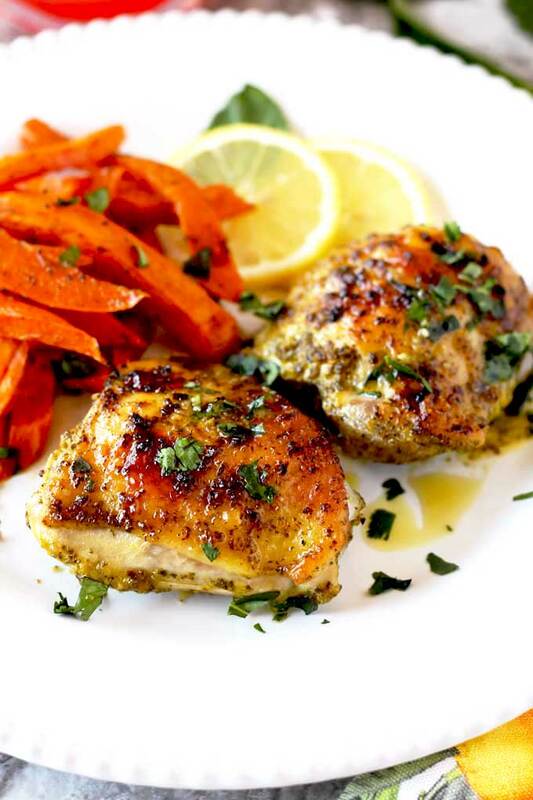 These mouthwatering roasted chicken thighs are so easy to make and incredibly flavorful! These roasted chicken thighs are marinated in a simple mixture of lemon juice, fresh herbs and spices then oven baked to juicy perfection. 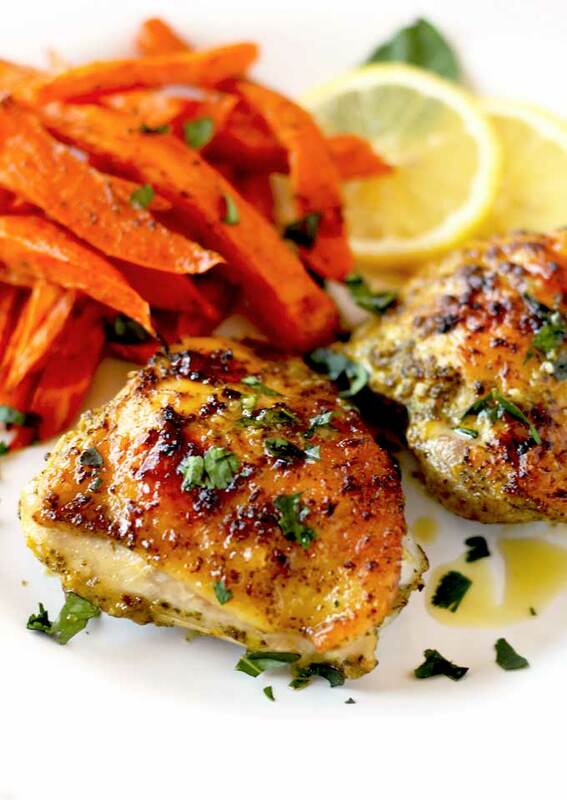 Baked chicken thighs are one of my favorite roasted chicken recipes. 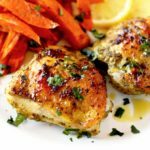 The thigh meat is super flavorful and the fresh marinade adds an amazing delicious taste to this baked chicken recipe. I like to serve this roasted chicken with the best Slow Cooker Mashed Potatoes or with this easy and light Creamy Cilantro Lime Coleslaw for a simple and flavorful meal! What Are The Ingredients To Make This Chicken Thigh Recipe? How To Make Roasted Chicken Thighs? At What Temperature To Cook Chicken Thighs? 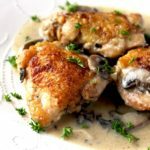 How Long To Bake Chicken Thighs? Can I Use Other Chicken Parts For This Recipe? Pat dry the chicken thighs with paper towels and season the chicken with salt and pepper. 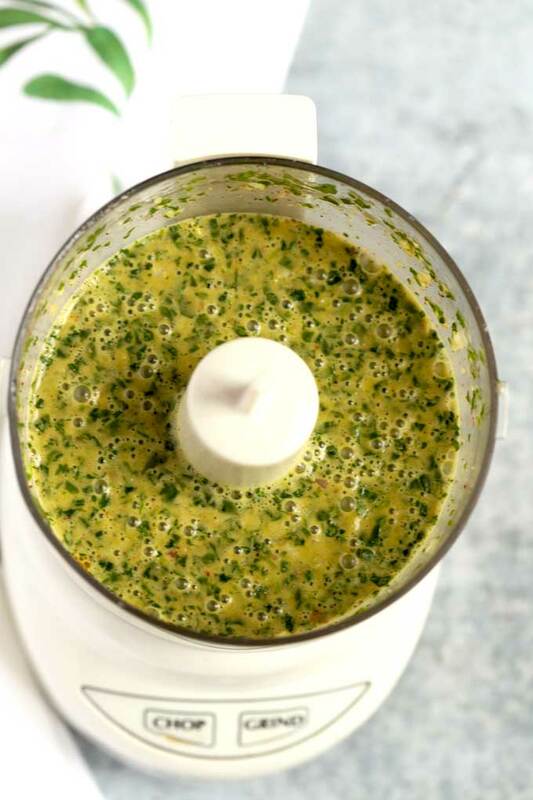 Place the marinade ingredients in a small food processor or blender. Blend until the mixture is smooth. Marinate the chicken thighs for 30 minutes or up to 24 hours. Remove the chicken pieces from the marinade and place them in a baking dish or roasting pan, skin side up. Bake for about 35 to 40 minutes or until cooked through and golden brown. The chicken should reach an internal temperature of 165 degrees before consuming. For a perfectly tender and juicy oven baked chicken with golden crispy skin, I set the oven temperature to 375 degrees Fahrenheit. Bake bone-in thighs for 35 to 40 minutes (depending on how crispy you like the skin). As per safety guidelines the chicken should reach an internal temperature of 165 degrees. Use an Instant-Read Thermometer to check the temperature before consuming. Absolutely! If you prefer make this baked chicken recipe with chicken drumsticks, bone-in chicken breasts or chicken quarters! If you prefer, boneless chicken can also be used. Just adjust the baking time. Trim some of the excess fat from the chicken thighs. 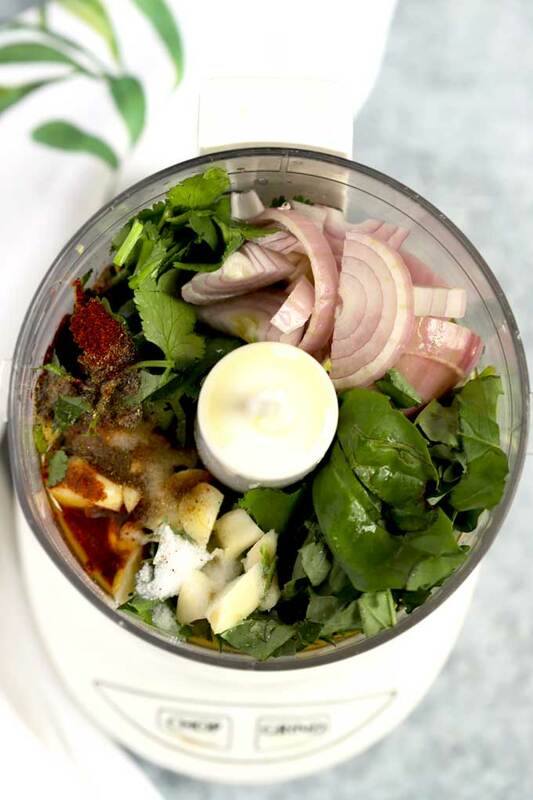 Pat dry the chicken thighs with paper towels before adding it to the lemon and herb marinade. If you marinate the chicken for over 20 minutes, place it in the refrigerator. Take the marinated chicken out of the refrigerator 20 minutes before you bake it. Use the flavorful lemon and herb marinade on pork chops, lamb, and even flank steak! 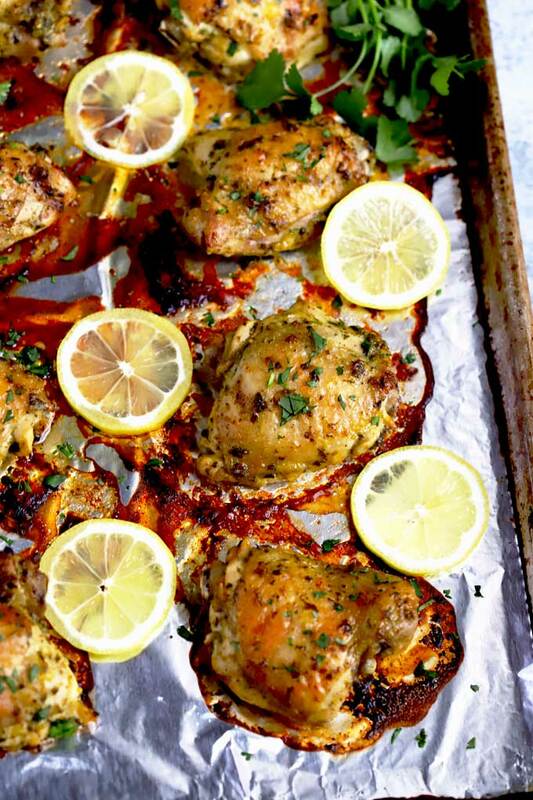 WANT TO TRY THESE LEMON AND HERB ROASTED CHICKEN THIGHS? PIN IT TO YOUR DINNER, CHICKEN OR MAIN DISH BOARD!! 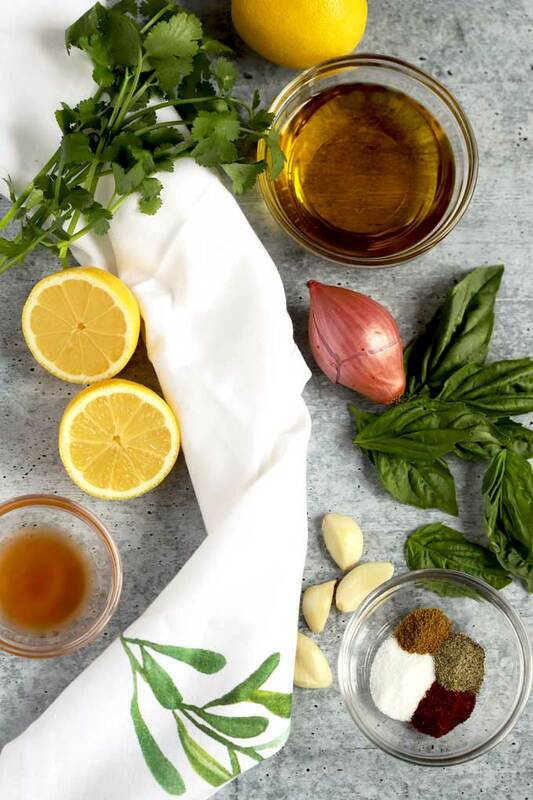 To prepare the marinade, in a food processor or blender combine the shallots, garlic cloves, basil, cilantro, olive oil, lemon juice, apple cider vinegar, salt, pepper, cumin and cayenne pepper. Puree until smooth. Lightly season the chicken with salt and pepper. Place the chicken in a large zip top bag or non-reactive container and pour the marinade over the chicken. Mix to combine making sure the chicken is coated evenly. Marinate at room temperature for 30 minutes or refrigerated up to overnight. Preheat the oven to 375 degrees Fahrenheit. 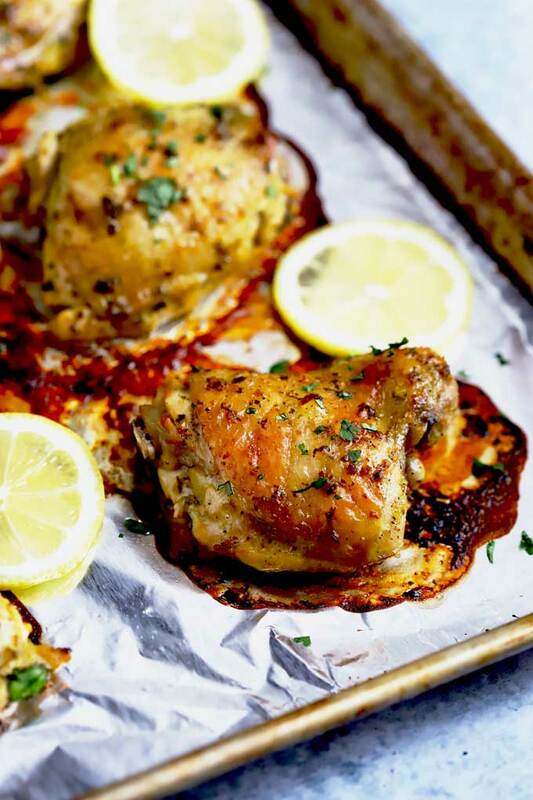 Place the chicken in a sheet pan or baking dish. Bake for 35 to 40 minutes or until cooked through and golden brown. Remove from the oven and serve. If your chicken is not golden to your likeness, you can turn on the broiler and broil for about 3-5 minutes. This chicken looks so good! I must try it! 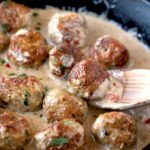 We made this recipe and it was absolutely fabulous! So tasty! Loved the crispy skin. Thank you Karyl! I love dark meat too! This looks amazing! I just put everything on my grocery list to be able to make it tomorrow! If it tastes even half as good as it looks in those photos Im going to be one happy happy girl! Thank you! You will love it. I promise! 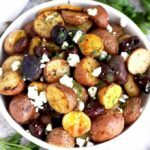 I made this recipe and it was so flavorful. I followed exactly as written and had great results. I will make this with chicken quarters next time. Hi Christina, No I do not cover it! Made this last night. It was awesome. Will definitely be in our meal rotation. I have a daughter with Celiac Disease and we try to mix things up as much as we can. This recipe hit the spot! I am so glad to hear you liked it! It is one of our favorites! Thank you for sharing!! How long would you cook if using quicken quarters instead of thighs? Excited to try this tomorrow! Hi! it all depends on the size. It may take 5 to 10 minutes longer but that is a guess. As per safety guidelines, bone in chicken quarters should reach an internal temperature of 165 degrees. Use an Instant-Read Thermometer to check the temperature. That is always the safe way to know!! I made the Roasted Chicken Tighs for my husband’s birthday and we loved it. I served it with mashed potatoes as you mentioned you like it and with roasted carrots. It was a winner at home, really delicious. I wanted to tell you that my family asked me to made this again and again since then. It looks like they really liked it! So happy to hear! Happy belated birthday to your husband!